Caput succedaneum and cephalohematoma are similar – but distinct – birth injuries which cause a baby’s head to swell. They are typically not serious and will heal themselves over a relatively short period of time. For most concern parents, you should know that caput succedaneum and cephalohematoma are not a big deal if they are not coupled with a brain bleed or other cerebral insult. So many people reading this are parents who have been told their child has caput succedaneum. When it is your newborn child — and I have four myself — it is easy to panic. But the good news is that in the vast majority of cases, caput succedaneum ends up being insignificant. The bad news is that these conditions can lead to more severe complications in the absence of a prompt diagnosis, vigilance, and effective treatment. Furthermore, the possibility that one of these conditions is connected with or arising from a more serious birth injury also means that immediate medical attention should be given to diagnosing and providing any necessary treatment for these conditions. The importance of prompt and effective diagnosis and treatment of caput succedaneum or cephalohematoma cannot be underscored enough. What would otherwise have been harmless can grow to become a more serious – sometimes life-long – condition on account of medical negligence. This can arise from failing to recognize the issue during or after delivery, a failure to provide proper treatment (such as a C-section, when warranted), or even failing to diagnose precipitating causes of the injuries prior to birth. If your child has suffered from one of one of these conditions as a consequence of medical neglect, you should be eligible to receive compensation. Contact me if you are looking for answers about your child’s case. I am going to walk you through some of the most frequently asked questions about caput succedaneum and cephalohematoma. Although this can cause some discomfort, it is not a life-threatening condition. However, as caput succedaneum can lead to other health issues such as jaundice, it is important that if your child may have this condition that prompt diagnosis and treatment is provided right away. Although the condition will usually disappear of its own accord, the possibility that it is connected with or caused by a more serious condition necessitates greater care to ensure no more serious condition develops. What is the cause of caput succedaneum? Caput succedaneum is caused by pressure on a baby’s head and usually occurs after a lengthy, difficult delivery. Often, these may just be the normal pressures exerted by the uterus and vaginal walls upon the baby’s head during a head-first delivery. Prolonged pressure from the dilated cervix or vaginal walls on the baby’s head can cause swelling, puffiness, and bruising. If the delivery proves to be longer and more difficult than is typical, the risk of developing this condition will increase. Furthermore, the use of forceps or other extraction tools – especially forceps or vacuum-assisted deliveries – can greatly increase the chances of this condition arising. Finally, this condition can also on some occasions develop even as early as 31 weeks, should the mothers’ membranes rupture too soon. In such a case, the development of caput succedaneum can usually be detected by ultrasound. Fetal alcohol syndrome or prenatal cocaine or marijuana use does not cause a caput succedaneum or cephalohematoma. The most prominent symptom of caput succedaneum is puffiness under the skin of the scalp. As a result, your baby’s head might appear to be abnormally large, bulging around the affected area. Once the swelling goes down, the baby’s head resumes its normal shape. Although caput succedaneum is typically only expressed in terms of these changes in appearance and symptoms of minor discomfort, there is a risk that more serious complications can arise along with or because of the condition. 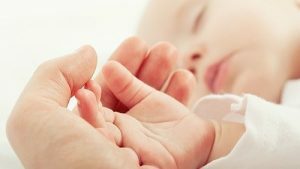 In addition, if there is a skull fracture underneath your baby’s swelling or if bleeding is extensive, the risks posed by caput succedaneum can be much more serious which is why a full, prompt diagnosis is medically warranted. How is caput succedaneum diagnosed? In order to diagnose caput succedaneum, no formal testing is typically required as a physical examination and observation of apparent symptoms (such as swelling or bruising) is usually sufficient. However, should caput succedaneum arise in utero due to a premature rupturing of the maternal membranes, it can usually be detected via ultrasound. As caput succedaneum can sometimes be caused by or accompanied by more serious conditions, a greater level of examination may be warranted to ensure there are no other related issues such as a skull fracture or extensive bleeding, which can result in more serious complications. As caput succedaneum almost always resolves itself within a few days, there is typically no need for treatment. Measures such as trying to drain the scalp area may only exacerbate the condition by leading to infections. If a more serious complication such as Jaundice has arisen, additional treatment is recommended in order to prevent lasting harm to your baby. In the case of Jaundice, treatments prescribed vary but may include light therapy, intravenous immunoglobulin, or exchange transfusion. Cephalohematoma is similar to caput succedaneum, as both conditions are birth injuries characterized by swelling in a baby’s head. What distinguishes cephalohematoma is that it is a hemorrhage (accumulation) of blood under the scalp and above the baby’s skull. Fortunately, it does not pose any risk to the brain cells because the blood accumulates above the skull. This condition is also similar but distinct from a subgaleal hematoma, which is characterized by blood accumulating above the periosteum (the membrane covering the outside of bones) directly under the scalp, while cephalohematoma is an accumulation of blood underneath the periosteum. What is the cause of cephalohematoma? What are the symptoms of cephalohematoma? The most obvious symptom of cephalohematoma is a soft, unusual bulge on the back of your baby’s skull. Due to its location under the periosteum, you will probably not see any cut or bruise on the surface of the skin over the bulge. Expect the bulge to feel harder as the blood calcifies, and then shrink and disappear after a few weeks under normal circumstances. Furthermore, if accompanied by a more serious condition such as a skull fracture, cephalohematoma can also lead to the growth of this fracture into a leptomeningeal cyst. Although cephalohematoma is typically not a serious condition, if these other conditions arise from or accompany it there is a possibility that your child may experience developmental delays, motor skill deficiencies, and a non-resolution of the condition. In more acute instances, long-term risks include the development of cerebral palsy. For this reason, it is important that your child is promptly diagnosed and provided with any necessary treatment for this condition even though it is typically only a minor affliction. To diagnose this condition, a physician will perform a physical examination of your child. Although the appearance of the bulge alone can often be enough to make a diagnosis, your doctor may also request additional tests such as X-Ray, CT scan, MRI Scan, or ultrasound to ensure there are no additional problems. As cephalohematoma can be indicative of a birth trauma that has caused additional injuries to the skull or brain – especially in cases where your child has experienced a pre-term or complicated birth – further investigation is warranted to ensure your child’s safety. What is the treatment for cephalohematoma? Typically, your child will be able to heal on their own from this condition within three months, and physicians will not need to provide any treatment unless additional complications arise. Although in some cases their physician may recommend draining the accumulated blood, this is usually not recommended, as complications such as infections and/or abscess formations can arise. If the condition results in a lowering of your baby’s red blood cell count (anemia), additional treatment such as a blood transfusion may become necessary. Should the condition result in jaundice (skin yellowing), light therapy, intravenous immunoglobulin, or exchange transfusion may be prescribed. If the condition does not rectify itself within a few months, it is recommended that you seek renewed medical attention and consider whether additional treatment is necessary. A subdural hematoma is a collection of blood located outside the brain. It differs from a cephalohematoma and a caput succedaneum.